Happy Friday to everyone! This has been quite a hectic week and I'm happy it's finally the weekend. As always, I'll be sharing my favorite things from the week. I hope you enjoy, and tell me what you're currently loving! I always like to listen to music when I'm working, and lately I've been loving listening to Christmas music. Instead of having to choose a playlist or album every few hours, I started listening to the 24/7 Christmas Radio Station on Youtube. This is constantly playing festive music in a variety of styles and eras, and I love it! I've been watching SNL on and off this season (mostly because I was tired of the constant election jokes) but I have to say last week's episode was one of my favorites of all time. Emma Stone hosted for the third time and was absolutely amazing. Even though there was a bit of political talk (duh), most of the skits were fresh and hilarious. To top it off, Shawn Mendes was the performer and he sounded amazing. I promise- this is the last time I'll talk about Penn State football this year! Onward State, the student-run blog for the college, recently shared their list of top plays from the year. It was great to look back at all of these amazing plays that really changed the course of our season. If you're a Penn State fan or just like watching good football, check it out! I talked about how excited I was to see this when it was first announced, and it finally aired! I didn't get to see it live, but I watched it last night and absolutely loved it. The casting was spot on (how amazing were Kristen Chenoweth and Ariana Grande?!) and everyone sounded fantastic (especially Dove Cameron..never even heard of her before this!). The stand out performance was definitely Jennifer Hudson killing "I Know Where I've Been". That's always been one of my favorite musical numbers, and she took it to another level. I have to share this amazing story from a Lowe's in Texas- read it and have your faith in humanity stored. Watsky - Ugly Faces : This song is SO much fun. I was obsessed with it as soon as I listened to it for the first time. Nas - Wrote My Way Out : I love the entire Hamilton Mixtape, so it was pretty much impossible to pick just one song. Listen to the entire thing, but if you only have time for one song make it this one. John Legend - Penthouse Floor : Oh man, I love John Legend. He has such an incredible voice and this is my favorite song from his new album. The Weeknd - Starboy : To be honest, I didn't like this song at first. When he performed it during the Victoria's Secret Fashion Show though, I fell in love with it! Bruno Mars - Chunky : This was also played during the fashion show and I'm obsessed..such an addictive song. I'm digging Starboy as well, but they are overplaying it. Like usual. Le sigh. I just finished watching that SNL skit and it cracked me up! I'm with you and watching on and off though. I've been resorting to catching the better clips on youtube after. I can not get enough Pentatonix Christmas songs, I love them all! I always forget about SNL. Luckily I'll catch funny clips online. I'm still not ready to laugh about the election though! We've had the new John Legend album on repeat lately-- and I can definitely relate to Starboy. It's one I don't really think I like, but when it comes on it's so catchy! Happy Friday! I heard that story about Lowes on the news the other day. That jusst one reason I like shopping there and love that you can take your dog in. I have brought Baylee shopping at Lowes before! Yesss! I love me some Christmas music! I need to check out that radio station! That Lowe's story is toooo sweet! Hooray for awesome companies. 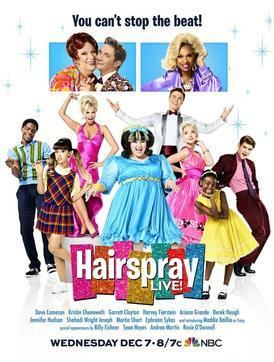 I missed Hairspray! I need to find it on line and watch it! I was upset to hear about the riots in PSU again! so annoying that the only way to celebrate was a riot! Come one PSU, we can do better than that!